For a limited time only get £10 OFF Added Sparkle Party Nights & £5 OFF Party Nights. The latest offer for our Family Fun Christmas Day at Eskmills, free Christmas dinner for kids! Fabulous Fizz and ice-cold beers too, waiting at your table on Christmas Day! Organise your Edinburgh Christmas party at our sparkling venue, enjoy a BIG family Christmas Day with your loved ones or bring in the New Year with our Hogmanay Ball. Eskmills venue will be lighting up Christmas for over 3,000 party people and our glittering winter palace awaits you! Indulge in a festive feast and delicious drinks with your colleagues or friends, then join forces with party-goers on the dance floor. Our Added Sparkle Party Nights on the 8th, 14th, 15th and 21st December feature a night of entertainment from our live band, Klones, who’ll make it a truly unforgettable night. Be the star attraction at our legendary party nights. They sell out fast, so check out the dates and details now. A turkey to carve at your table, entertainment for the kids and all the trimmings at our family Christmas fun day. Plus, book now and when you book 2 adults, 1 child will eat absolutely free! Looking to book at table of 10? Then we’ll have a complimentary bottle of prosecco and a bucket of ice-cold beers waiting for you at your table when you arrive! You needn’t go far to bring in 2019 in style. Come to the biggest and best Hogmanay party in East Lothian at Eskmills Venue.  Don your kilts, dust off those sequins and join us for a drinks and canapés reception with a seated three-course dinner, courtesy of Hickory, our award-winning caterers. If your organisation needs a big venue, why not book Eskmills for an exclusive Christmas Party all to yourselves? Join some of Edinburgh and East Lothian’s biggest firms who booked with us last year and consider doing the same for your exclusive event. We can accommodate up to 350 people (minimum number for exclusive hire is 80) for a sumptuous, luxury Christmas experience, either during the day, in the evening, or both.